WOOOHOO! Reyna tayo this month! Women’s month and SM Supermalls have a lot for you guys! All wednesdays of March may special treats and ganaps for you! Watson’s: Instantly get 10% off for every Php1,500.00 purchase! Bongga! Agad agad! And Watson’s have most of your pharma and beauty needs! San ka pa? Ace hardware: Believe it or not, matagal din ako tumatamabay dito kasi ng best in OC ako! haha! 5% discount on every P3,000.00 single receipt purchase! Tambay kayo dito, because honestly, you can only fully utilize and effectively use all your things kung properly organized sya. Kasi kita mo lahat! 🙂 Push! Maraming home solutions ditich! Our home: 5% for every Php15,000.00 purchase of furniture and 10% on every Php5,000.00 worth of accessories! Kabowg! Now is the time to renovate! Invest in your living space! Important bongga ang tulog at gising! SM Store: Or better known as SM Department store. Avail nyo ang SM Advantage card! 10% for every Php 3,000.00 single receipt purchase! Bongga ang accessories, must yan sa summer time in the city! SM Hypermarket and supermarket- single single, double double! choz! DOuble your points ang ganap on wednesdays! So Wed na magshopping! SM Appliance Center: Gusto nyo ng fans? Marami dito! Electric fans, standfans, ceiling fans! Choz! 10% on selected merchandise! 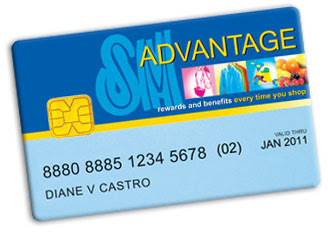 And last but not the least your SM ADVANTAGE card may mga members-only privy for avail nyo yun. Special events, sales and freebies! In and out of SM MALLS! Kabowg! TAKBO NA! See you there? Also para makajoin ka sa mga pasabog naming promos which we will announce soon!